“Kids like me didn’t go to Vietnam,” writes Jack McLean in his compulsively readable memoir. Raised in suburban New Jersey, he attended the Phillips Academy in Andover, MA, but decided to put college on hold. After graduation in the spring of 1966, faced with the mandatory military draft, he enlisted in the United States Marine Corps for a two-year stint. “Vietnam at the t “Kids like me didn’t go to Vietnam,” writes Jack McLean in his compulsively readable memoir. Raised in suburban New Jersey, he attended the Phillips Academy in Andover, MA, but decided to put college on hold. After graduation in the spring of 1966, faced with the mandatory military draft, he enlisted in the United States Marine Corps for a two-year stint. “Vietnam at the time was a country, and not yet a war,” he writes. It didn’t remain that way for long. A year later, after boot camp at Parris Island, South Carolina, and stateside duty in Barstow, California, the Vietnam War was reaching its peak. McLean, like most available Marines, was retrained at Camp Pendleton, California, and sent to Vietnam as a grunt to serve in an infantry company in the northernmost reaches of South Vietnam. McLean’s story climaxes with the horrific three-day Battle for Landing Zone Loon in June, 1968. Fought on a remote hill in the northwestern corner of South Vietnam, McLean bore witness to the horror of war and was forever changed. He returned home six weeks later to a country largely ambivalent to his service. To ask other readers questions about Loon, please sign up. My daughter Anna and author Jack McLean had something in common. They each decided that there was something important s/he wanted to do before beginning college. Anna wanted to go to Cambodia and work in an orphanage. Jack wanted to join the Marines and serve in Vietnam. Each one took the time to pursue and reach their goal. Eventually, with the goal achieved, Anna went to the University of Virginia and Jack went to Harvard. This is another story about Vietnam. It is not a novel. It is nonfiction My daughter Anna and author Jack McLean had something in common. They each decided that there was something important s/he wanted to do before beginning college. Anna wanted to go to Cambodia and work in an orphanage. Jack wanted to join the Marines and serve in Vietnam. Each one took the time to pursue and reach their goal. Eventually, with the goal achieved, Anna went to the University of Virginia and Jack went to Harvard. This is another story about Vietnam. It is not a novel. It is nonfiction. It is a story about something that I didn’t do when I was nineteen years old. Sometimes a book will sit on my shelf for many months before I read it. This book was unread for only three weeks. I was drawn to it as I often am to books about this war of my generation. Shows the world – we are bold. Rep-re-sents the blood we shed. Tell the world I done my best. Jack McLean was nineteen and ready to go to Vietnam. The slogan is “The Marine Corps Builds Men.” Jack learned in basic training on Parris Island, SC, that “the Marine Corps was about killing and following orders.” Enough said. Young Jack was an unlikely volunteer for the Marines. Most of his family assumed that he would go to college after completing his time at an elite prep school where George W. Bush was one of his classmates. But he chose to enlist in the Marines. His time in basic training was transformative as it is for many young men and cemented his determination to serve his country. He was eager to go to Vietnam and eventually did after months of service in a safe Marine supply center in Barstow, California. After eight months in Vietnam, his Charlie Company of “one hundred eighty boys” was sent on an offensive mission, transported by chopper into a hot zone, LZ (landing zone) Loon, where they were to provide cover for an engineering company and earth movers to prepare the site for large artillery to be brought in the next day, also by chopper. We are warned. But not given much time to prepare. It was to be our last calm. One of the biggest battles of the Vietnam War was about to be joined. By dawn of the third day, most of the marines of Charlie and Delta companies would be dead or wounded. And then it was over. Or was it? We had served. We had defended liberty on freedom’s frontier. We would not receive the kudos of a grateful nation and purposefully get on with our lives. But there were no crowds. Perhaps, we thought, all of that would come later. This book remembers that some of us called them baby killers. But what was the point? For some the war ended right there in Vietnam. For others it has never ended. Jack McLean’s body slowly rejected the tiny bits of shrapnel from LZ Loon. For nearly fifteen years afterward, tiny shards from that one round eventually rose to the surface of my skin. One by sickening one, I’d pull them out with tweezers. If a book makes me cry, I usually give it five stars. Loon: A Marine Story qualifies. Its style is hard to get into, as this author is not a writer. Most of it seems in a voice rather detached and stilted, from decades later than the events. And that aspect and affect dropped my interest considerably by the half way point of this book. Still, it is a very easy read, although I found that I could not linger in the Loon stand. Being of that era and prime year for nearly every male of my age that I knew to be drafted, I found some of his judgments and conclusions about who went and Its style is hard to get into, as this author is not a writer. Most of it seems in a voice rather detached and stilted, from decades later than the events. And that aspect and affect dropped my interest considerably by the half way point of this book. Still, it is a very easy read, although I found that I could not linger in the Loon stand. Being of that era and prime year for nearly every male of my age that I knew to be drafted, I found some of his judgments and conclusions about who went and how they went by the drafting process completely off. In fact, I do not think it was a war fought by just the lower classes of American males at all. Now, with the volunteer army it is actually far more so a lower economic class input. Lower educational input, as well. Where I was many, many higher class or solidly middle class guys went. Did they school for awhile to think about it? Sure, they did. But did they go to Canada or have someone pay a draft board? No. They heard JFK's voice about giving back, not asking- for one thing. But beyond all that, this author was so young and is not any longer. And the letters are great but the rest is just a gloss and jump report. He has buried much of the prime thoughts and feelings I would have liked to find more of in this book. Except about Sid- and I find that a clue to how really deep he has buried the rest. His battle copy, assignment location and unit is excellent. His was a service much more toward the first than the last of this War. Yet his homecoming chapter read like a newspaper article, very detached. The soldiers coming home a couple of years later were treated far worse than just the neglect to acknowledgment or expressed appreciation or parade or handshake that he mentions. Traumatized men were spit on and called names in the airports in CA every single day. One of my friends became a type of greeter to become a barrier to this. A disappointing purchase and way over-priced. One of the really positive benefits of the self-publishing revolution has been the number of memoirs being published. Obviously many not polished, but interesting and of considerable historical value. Some are very good, indeed. Others less so. This one felt like a book one expects to have been self published; I looked, and was surprised to see the Random House imprint. Mclean, who was at Andover with George Bush, (of National Guard and cocaine fame,) A disappointing purchase and way over-priced. Mclean, who was at Andover with George Bush, (of National Guard and cocaine fame,) struggled through Andover and when he wasn’t accepted by Harvard or Yale, or Stanford, was at a loss as to what to do. So he enlisted in the Marines. He was born just a month before me, so the dates brought back many memories. Getting out of Parris Island, he was sent to California for a few months to learn supply, much to his relief, but everyone in the Marines eventually wound up in Vietnam, and, sure enough, his orders for that quagmire came through. Mclean was urged to write this memoir when his wife discovered the letters he had written home over the months he was in Vietnam. The very short section, barely a couple chapters, dealing with the horrific, if futile, experience on LZ Loon, was seemingly thrown in almost as an afterthought, rather than the highpoint (or low-) of his experience, his life even. Clearly the experience of writing for him personally must have been necessary and cathartic, I hope. There is a good story in here and perhaps with a good editor, it could have been teased out. It lacked focus and at times wandered between being critical and stand-up-salute-your-flag bravado. Finding a theme was difficult. There are many other Vietnam memoirs out there that I feel are much better. And I got a little tired of hearing that Sid was dead six weeks, two days, several weeks, later. Once has devastating impact. By the fourth time, it brought a yawn. Having finished Loon: A Marine Story by Jack McLean just a few hours ago, I was frankly at a loss as to how to start this review. Adjectives such as “exceptional” and “sublime” are accurate enough, and yet somehow do not convey the depth of my enjoyment and admiration for this memoir of a young man who left a life of comfort and privilege to enlist in the United States Marine Corps at a time when combat duty in Vietnam was all but certain. 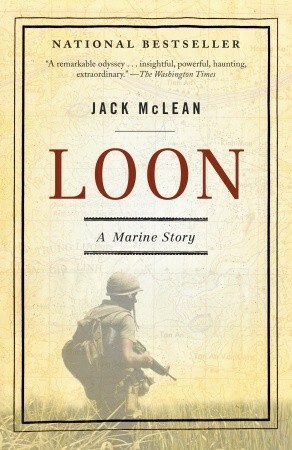 Finally, I decided to rely on my own years in uniform and Having finished Loon: A Marine Story by Jack McLean just a few hours ago, I was frankly at a loss as to how to start this review. Adjectives such as “exceptional” and “sublime” are accurate enough, and yet somehow do not convey the depth of my enjoyment and admiration for this memoir of a young man who left a life of comfort and privilege to enlist in the United States Marine Corps at a time when combat duty in Vietnam was all but certain. Finally, I decided to rely on my own years in uniform and go with what was always the topmost ranking a Sailor could achieve in any endeavor or performance review: Outstanding. Loon is simply outstanding. Jack McLean had a picture-perfect, upper-middle-class American childhood and adolescence. Born in the earliest wave of the post-WWII baby boom, he lived in the suburbs of New York City, learned to swim at the Y and had a paper route. McLean followed his father by attending prep school at Phillips Academy, with future President George W. Bush as a fellow student. But McLean struggled at Phillips and five years later when graduation finally came into sight he found colleges less than interested in him. That was fair, though, as he found himself less than interested in attending college right away. There was more to that decision than simply taking time off from school. There would be two issues that I would have to face should I decide not to go to college. The year was 1966. There was a draft. If you were eighteen or older, male, and of sound body and mind, it was your duty—indeed it was the law—to serve the country in the military for a minimum of two years. Second, there were my parents. I was certain that their vision for me included college—any college. — Mclean, Jack (2009-05-07). Loon: A Marine Story (pp. 15-16). Random House Publishing Group. Kindle Edition. Robert F. Kennedy was forty-two years old. He died the following morning, on June 6, 1968. Those of us in Charlie Company who survived LZ Loon would not hear the news for another week. Many of us died that day as well. — Mclean, Jack (2009-05-07). Loon: A Marine Story (p. 2). Random House Publishing Group. Kindle Edition. Mere weeks after surviving the fight at Loon, McLean is on an airplane for home, his tour of duty complete. Just months after Loon, McLean began his freshman year at Harvard, in the process becoming the first Vietnam veteran to attend that prestigious school. Loon isn’t a military history of a battle; the details of the three-day fight at LZ Loon are vivid but somewhat unspecific — this reader suspects out of respect for the fallen. Instead, it is the story of how one boy became a Marine, and what that meant to him and about him. McLean’s journey started differently than the other men he served with in Charlie Company, but each man passed the same tests along the path to becoming a Marine and in doing so they became brothers. One year after my graduation from Parris Island, I was in Vietnam, fighting side by side with my marine brothers, when I was shot at with live ammo for the first time. During the ensuing battle and the others that followed, I was confused, disoriented, and scared to death—every time—but I was never alone. There was always another marine nearby. He also was confused, disoriented, scared to death—but he had me nearby. That was the way it worked in the Marine Corps. Together we’d figure something out. — Mclean, Jack (2009-05-07). Loon: A Marine Story (p. 59). Random House Publishing Group. Kindle Edition. For more information on the author and his writing, visit his website. Another book that I can totally identify with. Jack was in Vietnam a year before I was. We covered a lot of the same territory. I too was at bases along Rt 9 - Camp Carroll, VCB, Dong Ha, Quang Tri, Khe Sanh. I too had to leap out of the back of heliocopters who wouldn't set their wheels down on the earth, I too walked through elephant grass that was 8 feet or more tall. I too was mortared by the NVA and I too served in the 4th Marines. I could picture in my mind all his movements. Because of th Another book that I can totally identify with. Jack was in Vietnam a year before I was. We covered a lot of the same territory. I too was at bases along Rt 9 - Camp Carroll, VCB, Dong Ha, Quang Tri, Khe Sanh. I too had to leap out of the back of heliocopters who wouldn't set their wheels down on the earth, I too walked through elephant grass that was 8 feet or more tall. I too was mortared by the NVA and I too served in the 4th Marines. I could picture in my mind all his movements. Because of this emotional connection I gave the book 5 stars. Jack writes about his total Marine Corps experience from boot camp to Vietnam, with the action he participated in, the friends he lost, his arrival back home and attendance at Harvard University. Wow! I have seen a lot of war movies and read a lot of war books...Loon ranks up there with the very best. In 1967, Jack McLean enlisted in the Marines right out of a prestigious prep school rather than go to college. The book is about the path he took at the height of the Vietnam War which took him into combat as an infantryman. McLean is an articulate and perceptive writer (having later attended Harvard) and spins a great memoir. He captures the essence (and dissonance) of what the war was like Wow! I have seen a lot of war movies and read a lot of war books...Loon ranks up there with the very best. McLean is an articulate and perceptive writer (having later attended Harvard) and spins a great memoir. He captures the essence (and dissonance) of what the war was like "at the pointy end of the spear," where so few of us have been. All of us can read about war as history-- McLean and his Marine brothers lived war. Casualties were not just nameless faces, they were his best friend Sid, or Tom, the ultra-cool guy that everybody wanted to be like, or so many members of his tight-knit group. The rest of us will never be able to comprehend that special, peculiar bond between combat veterans...He made me feel guilty about my missions flown from the relative safety of my air-conditioned cockpit, though that was not his point. McLean pulls you right into the jungles of Vietnam with his memoir. It is compelling, gripping and humbling to read of the horrors of a war that was played out by our young men. No matter what you think or thought of the Vietnam War, this is a must read. The only way to sum it up is to say thank you to McLean and all of the others that answered the call to duty. "Lém arrested Lieutenant Colonel Nguyen Tuan with his family and forced him to show them how to drive tanks. When Lieutenant Colonel Tuan refused to cooperate, Lém killed Tuan, his wife and six children and his 80-year-old mother by cutting their throats. There was only one survivor, a seriously injured 10-year-old boy. Lém was captured near a mass grave with 34 civilian bodies. Lém admitted that he was proud to carry out his unit leader's order to kill these people. Having personally witnessed the murder of one of his officers along with that man's wife and three small children in cold blood, when Lém was captured and brought to him, General Loan summarily executed him using his sidearm"
This is just one of many instances that the author gets wrong. Some of his stories, according to his contemporaries I've spoken with, are entirely fabricated. He can't even get his facts about the men who served right and simply parrots the usual myths. This was a fascinating and sometimes heartbreaking book. I was born in 1954, female and pretty sheltered but I did live through this time. I have a brother who is 6 years older and I can still remember the collective family sigh of relief when the draft #s were published in the paper and we all realized his was very high and he was relatively safe. Many thanks to the men and women who went to Vietnam and served. They were treated badly when they came home. Books like this help me understand that This was a fascinating and sometimes heartbreaking book. I was born in 1954, female and pretty sheltered but I did live through this time. I have a brother who is 6 years older and I can still remember the collective family sigh of relief when the draft #s were published in the paper and we all realized his was very high and he was relatively safe. Many thanks to the men and women who went to Vietnam and served. They were treated badly when they came home. Books like this help me understand that war and that time. This was a great book of a difficult time in USA history. A very good account of what it was like to grow up 18 years old in 1967. I would like to thank the author for his service (about 50 years) to late. God bless you and all who have served and will serve our country. We still may not understand why we were in this war, but it is important to understand why so many are willing to sacrifice in service of our country. Incredible detail in a very relatable story from Jack as a young man. I come to realize that I was at Parris Island in the 3rd Bn the same time as Jack McLean. My tour in Vietnam paralleled his exactly. His description of Vietnam was exactly the way it was. Mostly about the mundane involved in the Vietnam experience. It accentuates the stark difference when things went off the rails. Worth your time. I figure that’s what matters most though, right? I was with 3rd battalion 9 th Marines. in Vietnam in August of 67. Great book as I can relate to the authenticity and accuracy of this book. A compelling read by a member of my generation. Vietnam was our war and Jack McLean describes the war and his part in it in precise, gripping prose. It was a good book. Interesting to hear about the author's experience in Vietnam. This is a very straightforward memoir by an infantry corporal. There are no histrionics but it has none the less impact for that, it's honesty carries it. The man was no doubt a matter of fact soldier who knew his craft and simply got on with it like so many I knew. There is no crying in the beer but reading between the lines, his tour of duty cost him as it did almost anyone who saw combat there. I did not serve in the area of the country where he saw his service though having spent time in tho This is a very straightforward memoir by an infantry corporal. There are no histrionics but it has none the less impact for that, it's honesty carries it. The man was no doubt a matter of fact soldier who knew his craft and simply got on with it like so many I knew. There is no crying in the beer but reading between the lines, his tour of duty cost him as it did almost anyone who saw combat there. I did not serve in the area of the country where he saw his service though having spent time in those mountains some thirty years later my hat is off to the Marines who did. It is truly hard country and they were always contending with the NVA who were never slouches in the endeavor of soldiering hard. They were no doubt the best light infantry in the world at the time. Their length of service and depth of experience gave them that.This is a book I would be happy to give to teenagers to impart to them what those not much older than they lived through in service to their country. The Marines in I Corp particularly. It leaves much to the imagination but it's not hard to get the message. I really enjoyed Loon. It's a pretty typical memoir, told from the eyes of Jack McLean who was the first Vietnam veteran to attend Harvard after serving in Vietnam. It's a very well written book. It doesn't dwell on anything too long and does a great job of mixing informative back-story with compelling firsthand narrative. Many times, memoirs get bogged down in one area of the author's history that he really wants to explore, and consequentially the entirety of his reading audience is forced to I really enjoyed Loon. It's a pretty typical memoir, told from the eyes of Jack McLean who was the first Vietnam veteran to attend Harvard after serving in Vietnam. It's a very well written book. It doesn't dwell on anything too long and does a great job of mixing informative back-story with compelling firsthand narrative. Many times, memoirs get bogged down in one area of the author's history that he really wants to explore, and consequentially the entirety of his reading audience is forced to explore it with him. Not so with Loon. McLean gives us enough of his backstory (before signing up with the Marines) to help us understand who he is and why he would leave a comfortable New England society to serve in an unpopular war, but he does so with a deft touch. Moving the story along with interesting stories of his tour and helpful contextual events to help the reader see the larger picture. A book about a Marine fighting for his life during the Vietnam War. This book was sad. It's about the Vietnam War, so many people died and the soldiers have to consistently fight for their lives. McLean started readers off right in the middle of the action before backtracking to tell people the how and why he was in Vietnam during the war. As many other readers will say, writing is not necessarily McLean's strong point. I had to read this book for class, and overall it wasn't a bad read. It provided an additional perspective to the war in Vietnam. Not my favorite memoir, but not my least favorite memoir either. I always feel bad for judging people writing their life stories, but for this book the writing felt detached. However, as I previously stated, it showed a unique perspective of the war and its lasting effects of soldiers. Jack McLean's Vietnam memoir looks at his tour as a Marine at the height of the America's involvement in the war. The book is from a fairly unique perspective; McLean enlisted after prep school, taking a route that most of his classmates avoided. McLean splits his time between introspection and full-on machismo. The former lends some poignant moments to the narrative, especially near the end, as he looks back at the emotional wounds. The latter — which pops up mostly when McLean writes about his Jack McLean's Vietnam memoir looks at his tour as a Marine at the height of the America's involvement in the war. The book is from a fairly unique perspective; McLean enlisted after prep school, taking a route that most of his classmates avoided. McLean splits his time between introspection and full-on machismo. The former lends some poignant moments to the narrative, especially near the end, as he looks back at the emotional wounds. The latter — which pops up mostly when McLean writes about his unit's action at LZ Loon — takes the form of rattling James Patterson-esque chest beating. It almost seems like McLean's terseness in the prose reflects his surroundings; that doesn't make it any easier to read, though. The writing style isn't bad - it communicates his experiences well. Given the hints he drops about how it carried this history with him form any years, I expected some coverage of that, or some reflection on the experience beyond some hints of why it may have been not a great war for the US to have jumped into. Although perhaps this is because It covers McLean's 2 years in the Marines (1 year in Vietnam), as well as a smattering about his schooling prior (Andover) and his entering Harvard after.